These words of wisdom by Perth architect Philip Griffiths were shared in a 2012 interview with A&D, but are no less relevant today. Apart from being a more sustainable way of building, with the shell of a structure and existing materials often kept and reused, heritage projects help to prolong a city’s history through its building materials and design integrity. Here are five recent Australian projects that have retained a little bit of their past, as well as added value to their surroundings and landscape. All projects were entered into the 2014 AIA Architecture Awards. This shelter in the Gudgenby Valley in ACT was erected to entice visitors to the Namadgi National Park Visitors Centre, which allows for the consideration of the pioneer heritage of southern ACT. Formally a lightweight, interpretive shelter, Gudgenby in a Box was built from the remnants of the original Gudgenby Homestead which sheltered pioneer familiies from 1845 to 1964. These remnants had been placed in a storage container for many decades, and today is used to reconstruct the ‘front’ wall of the ‘display box’. The shelter’s design also pays homage to the vernacular form of the original hut and nearby visitors centre through its corrugated iron roof and steel and timber structure. In addition, rammed earth references another common early settler building system, while allowing the natural ageing process to continue. The sheltering structure was designed in collaboration with Scott Bland of Northrop and the reconstruction of the slab wall with craftsman Myles Gastelow. Originally built in the 1930’s and recently renovated, the Former Home at Queensland’s Mt Maria College was designed to embody the school’s ‘Family Spirit’ value, and act as the heart of the campus. With defined precincts set out in the masterplan for the middle and senior years within the school, the architects saw an opportunity to use the existing building to connect and provide an overlapping precinct where the school community comes together. As a result, the heritage-listed Former Home now includes administration, staff, student support and library functions – amenities that allow for the amalgamation of two campuses. Apart from using the original building, materials such as doors and stained glass were salvaged and reused, as was the former hardwood ceiling structures used as battening. At first glance, this residential dwelling appears to be a new, contemporary building. But a closer inspection reveals that the steel and glass structure is an extension of a grand heritage home. According to the architects, a fire had destroyed a two storey section of the house, but the option of rebuilding was rejected in favour of a modern addition. The old and new are now separated by a courtyard, but linked by a glazed walkway, with a portion of the stone wall from the fire damaged section of the house retained and restored. Precise detailing with black framing, dark grey fibre cement and iron allow this new addition to complement the original heritage house, yet set itself apart as a timeless structure. As one of the oldest museums and art galleries in Australia, as well as the primary repository of Tasmania’s natural and cultural material collections, the TMAG in Hobart is indisputably of national significance: the individual buildings on site contain the earliest surviving European structures in Tasmania, and the most intact pre-1850s Bond Store structure in the country. The redevelopment by fjmt worked within the existing heritage fabric to provide public access and reveal new opportunities for the gallery, including areas previously unavailable for public access due to the configuration and fragile nature of the buildings. New works have been ‘inserted’ into the existing building, drawing inspiration from references of local artefacts and imagery within TMAG’s collection as well as the existing heritage fabric. 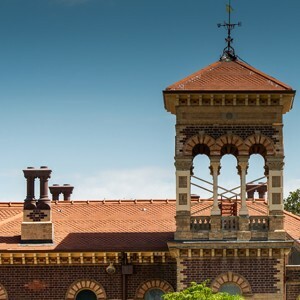 The roof of the Rippon Lea mansion in Melbourne had needed urgent repairs for a long time, with The National Trust agreeing that the 1960s Marseilles tiles should be removed and the original roof covering reinstated. In response, the design team reconstructed the diaper pattern tilework using two shapes of ready-made terracotta tiles with help from enlargements of historic photos from the early 1900s, and fragments of preserved tiling. Replacement ridge cappings were made in Melbourne based on surviving examples. Going one step further, the team also investigated ways to increase the environmental and economic sustainability of the house without compromising on the proposed aesthetics. On this end, a 4.5kW bank of solar panels has been incorporated into the tiling in the reinstated roof valley, while a new stormwater collection system has been installed parallel to the 19th century original. Insulation was also added to the previously un-insulated roof.